While this is a fairly elegant and powerful technique, it also has its drawbacks once we need more precision in the positioning. It is difficult to place the anchor points in such a way that all the tehtar combine nicely with all the tengwar. In the example below, the tehtar and the tengwa óre all have their anchor points in the logical places, visually centered horizontally. Now, where should the anchor point be placed on silme? We can align the i-tehta in a visually pleasing way, and then it will define silme’s anchor point. But, what happens if we then try to use that point to also attach the a-tehta? 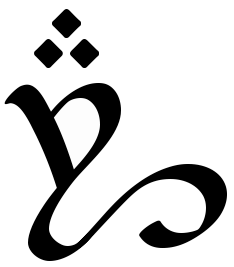 It won’t work very well: wider tehtar should ideally be adjusted to not collide with tengwar with ascenders. To deal with issues such as this, one could use more anchor points, introduce kerning after the positioning, use alternative glyphs, etc. Needless to say, things easily get very complicated. That is one reason, but the main reason why I’m moving away from anchor points is that they are difficult to implement with AAT, Apple’s smart font technology, and I would very much want to have Tengwar Telcontar work on the Mac. So, instead of anchor points, I will rely solely on contextual glyph substitution: exactly as how tehtar are positioned in Dan Smith’s fonts, there will be a number of glyphs for each tehta, each with varying displacement, but unlike Dan Smith’s fonts, the correct glyph will be chosen automatically, and, for me as a designer, there is no specific restriction on how many different glyphs I may use — I foresee that I may use as many as ten or more for each tehta, to get exactly the positioning I want on each tengwa. In short, I will have to rewrite a large part of the code, but the end user will probably not notice the difference. Unless they use a Mac, that is. (If you have never heard about Metafont before, you might be interested in reading the Wikipedia article before continuing with this post.) Metafont is very different from usual font editors, such as Fontlab or FontForge; in fact it is not an editor at all, but rather a compiler that takes program code as the input and outputs a font. To design with Metafont is much more similar to writing a computer program, than to draw a picture. These Bézier curves are convenient to work with, and you can easily form virtually any shape with them. In fact, I found out when I started working on my first font that they were too versatile for my needs. So far, my fonts have been essentially calligraphic; that is to say, the glyphs are designed to look as if written with a pen. And when I attempted to achieve this by drawing the contours, I found that far too much time went into such things as ensuring consistent weight, forming nicely rounded line endings, etc. But if I were to write the letters using the method I wanted to imitate, i.e. with a pen on paper, I would not have to worry about things like that. All those features would come automatically, since they are defined primarily by the pen itself, independently from how I move it. (Obviously I’m talking about an “ideal” pen here.) What I wanted to spend my time on was to define the motion of the pen. The classic font Tengwar-Gandalf by Michael S. Elliott has no official web site – being originally released through BBS! It is however available all over the web, on various Tolkien fan sites (here, here, and here, to name just a few), as well as on most generic font sites. At all of these places, the font has been repacked: sometimes the archive contains only the TrueType font file, sometimes the original plain text documentation is included but not the illustrated one, and sometimes other files are added as well: for example, this archive contains converted font files in Type1 format. Thankfully, the original TTF file seems to be byte for byte identical in all distributions. After more than two years, an updated version of Tengwar Telcontar is finally available. For more information, head over to the Free Tengwar Font Project, or see the announcement on the Elfscript2 mailing list.